I thought that I was pretty unbiased in my appreciation of vegetables. But I realized that I really just want to cook with cauliflower and brussels sprouts, again and again, every week. They are the first vegetables that come to mind no matter what new dish I am brainstorming. Rarely am I inspired by cabbage, beets, bell peppers, or eggplant. So I’ve been aiming to change my ways. Get out of my vegetable comfort zone and expand my gustatory horizon. And that’s how we got here. 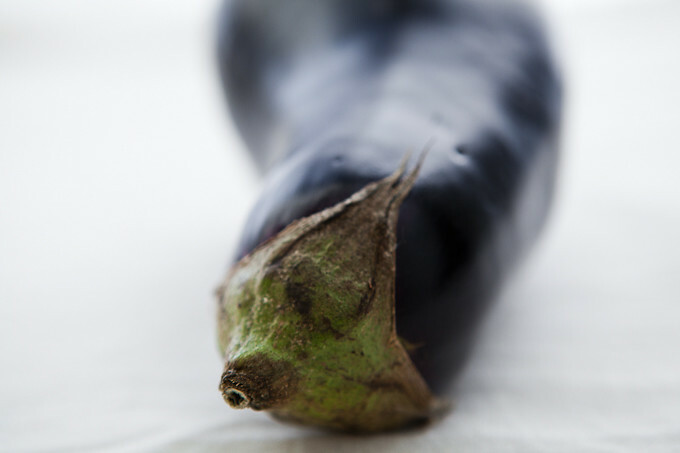 I am pretty certain that I love eggplant in the right context – soft and spicy and stir-fried with basil at a Thai restaurant, or in eggplant parmesan, of course, that cheese-burdened but deeply delicious staple of childhood dinners at Italian restaurants. But it’s been years since I’ve considered preparing it at home. And perhaps that is because I have failed with eggplant and that failure has resulted in a bitter dish that left a terrible feeling in the tummy. No wonder! This time I was determined to have an eggplant win. I recalled the tangy miso dressing from Bon Appetit’s Food Lover’s Cleanse and had a suspicion that it would be a great ally atop some slow-roasted eggplant. And it was. So much so that I ate more of this in one sitting than I’d like to admit. Salty, faintly sweet, with the smoky flavors of sesame oil and the bright pucker of rice vinegar and lime, it’s the perfect foil for soft, creamy eggplant. Finish with fresh cilantro and some spicy togaroshi (a Japanese condiment of chili and sesame) and you’ve got a hefty, gratifying dish. Prepare the dressing. Whisk together rice vinegar, sesame oil, honey, lime juice and zest and water. Next, blend miso with the ingredients, using a fork to mash and then form into a paste. 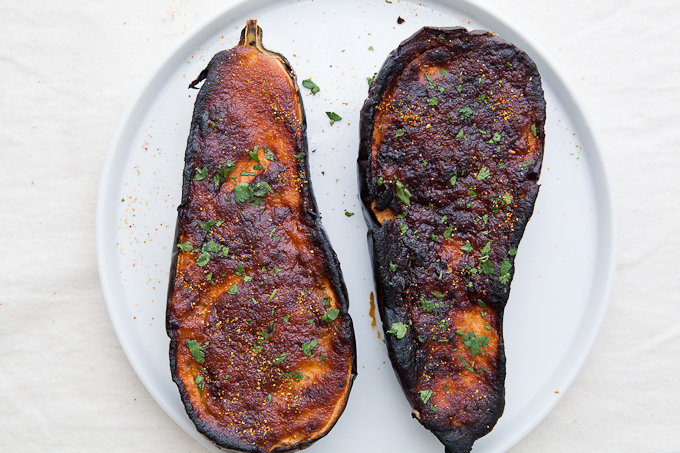 Roast until eggplant is falling-apart tender, about 45 minutes to an hour. Remove from oven. Sprinkle with cilantro and togaroshi, if desired. When eating, it’s best to mix together the miso dressing with the tender eggplant beneath to distribute the salty miso flavors. Sasha - You have inspired me to also get out of my vegetable comfort zone! A bit over a year ago I went to Israel where I ate more eggplant in a week than I probably had my entire life. Most often I ate it simply roasted with a generous heaping of tahini. I was hooked and I promised myself that upon returning to my kitchen I would cook and eat eggplant more often. Sure enough, I roasted it once and then ate it with lots and lots of tahini only to then return to my vegetable comfort zone. Erica - I discovered your website today and I love it! The photography is gorgeous and I love your vegetarian recipes.